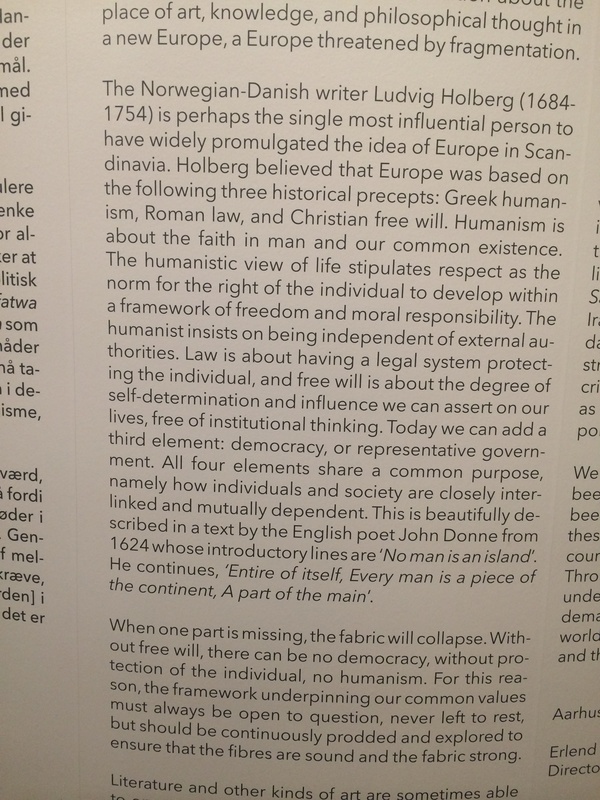 This statement is from an exhibit in the Arts Museum in Aarhus and captures the values of the enlightenment in a way that spells them out so that they can be understood in the times in which we live. This entry was posted in Ethics and morality, Philosophy. Bookmark the permalink. The elite’s will be done is the rule now. Free will is obsolete. I love this interpretation of the heritage of European civilisation based on Greek humanism, Roman law & Christian free will. I have not read anything of Ludwig Holberg before. I would add the tradition of critical thought derived from the practice of Talmudic questioning. This completes the background of our Judaeo-Christian heritage. I’d like to quote here from a poem circa 1840. Mark well the words I say ! Squalid weed above refers to dress, garment or attire. I was thinking of it more as a contemporary person. Now if you just put that into Arabic, it would fit our Judao-Christina-Muslim Civilisation! Otherwise, there’ll be Holy war to pay! Europe based on Greek humanism, Roman law and Christian free will – I would argue there is a bit more to it than that, but yep, at a pinch, that’s a valid argument. You also need a European landmass, making it impossible to impose uniformity on all people. The diverse landscape couldn’t help but produce diverse cultures. Other places weren’t so blessed. This book was recommended here on Catallaxy by Ellen of Tasmania I believe, and I thank her today for this. The “Christian free will” cited in the text is too ambiguous to be very helpful here. Most Christian traditions regard free will as limited by the condition of original sin, although they define those limitations variously. It was the belief in original sin which led Christian theorists to propose checks and balances on the sovereign power of any polity, whether that be a monarchy or the electorate in a democracy. The founding fathers of the US, perhaps the most vibrant democracy in history, were under no illusions about the fragility of the democracy they were proposing – they knew it would only survive and prosper while the people remained virtuous. Btw, those interested in how Christianity re-formed Western civilisation after the collapse of the Roman empire should read Larry Seidentop’s “Inventing the Individual: The Origins of Western Liberalism”. He is, afaik, a secular Jew, so he has no religious axe to grind. Btw, those interested in how Christianity re-formed Western civilisation after the collapse of the Roman empire should read Larry Seidentop’s “Inventing the Individual: The Origins of Western Liberalism”. He is, afaik, a secular J e w, so he has no religious axe to grind. Aarhus is a very, very, very fine hus …. 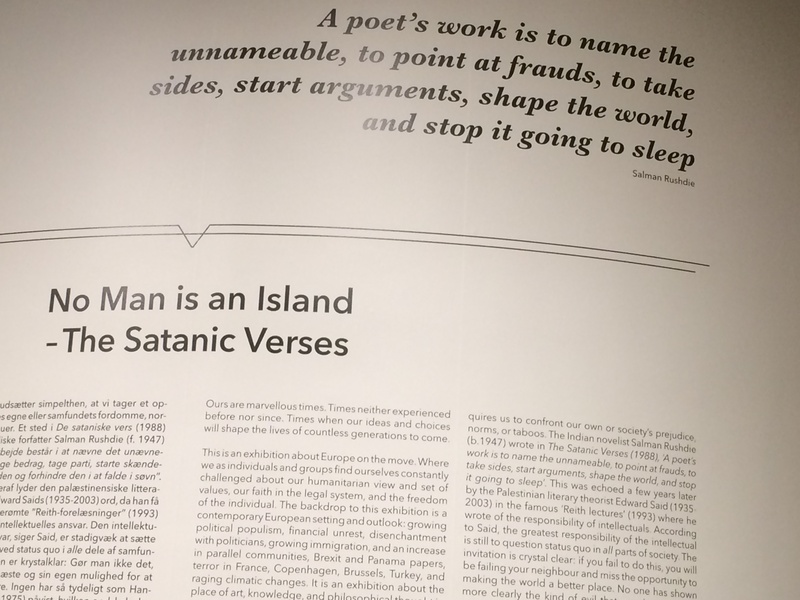 Does anyone know the name of the book Steve photographed for his exhibit? The cornerstone of trade unionism is compulsory membership. Are they stupid, gullible or malicious? Is North Korea defying China? Hey … What did I miss?